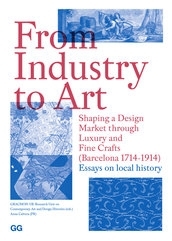 This book examines the historical origins of design in Barcelona emerging during the modern era, the extensive period spanning 1714 to 1914. It charts the different stages of the industrial revolution exploring theory, the work of artists and artisans, the articles produced by industry and the ways in which these products were consumed. Topics covered in this volume include: design and illustration in the eighteenth century; the debate between Art and Industry that arose in the nineteenth century; the influence of Modernisme on creative, productive and consumer behaviour; the advent of foreign influences and their local re-interpretation; and the figure of the decorator during the Art Deco period. In need of an unequivocal description, the history of design explored in this volume is that of an unidentified aesthetic practice moving between industrial, applied and decorative arts, crafts and the artistic works of artisans, art industries and the sumptuary or decorative arts. Although an incipient demand for design arose in the eighteenth century, the discipline would have to wait some time before making its full presence known. And yet, Barcelona would witness the emergence of a design market among the whims of everyday luxuries and a new Art that would soon be considered a Fine Art in its own right. GRACMON-UB is a consolidated and interdisciplinary research group bringing together professors and researchers from the Department of Art History and the Department of Design and Image of the University of Barcelona. With an extensive trajectory in the study of Modernisme in Catalonia, in recent years the group has focused its efforts on the history of contemporary art and design.